From first sight to final inspection, a thorough utility pole inventory and inspection is a vital part of successful field asset management. But what goes into a typical NESC inspection of poles in the field? Today, with the help of Alden’s Jonathan Brigham, we walk you through the process from A to H.
The first thing a technician will do when beginning an NESC inspection is get a good look at assigned poles from a short distance away. They will then take a picture of each utility pole, making sure to capture all the relevant information and scan the surrounding area for client-specific violations as well as NESC mandates to be addressed. At this point in the inspection, the technician will begin to capture any violations found, often using a handheld collection device that makes data entry for field asset management easy, organized and seamless. Some violations may be more urgent than others; those will be reported right away, and the technician may even take another photo or make special documentation to ensure the issue is clearly identified and remedied. Once he or she has found their way to just beneath the pole, the technician will capture a few specific details about the pole itself, including its GPS position. They will also look for the pole’s brand. 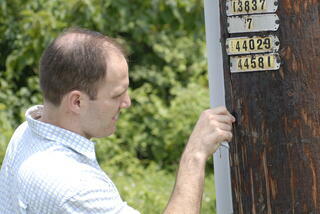 Jonathan adds that branded information can tell a person a lot about a pole, including “height class, placement date, material type, pole ownership, pole number, and more.” Close-up, the technician will also give the pole a good visual once-over for further violations from loose guy wires and structural deficiencies to missing or damaged ground wires. Other typical inventory items captured after a pole has been identified and plotted on the map generally include doing a survey of attached equipment. “Abandoned or damaged equipment, improper grounding, and inadequately secured or attached equipment are just a few of the violations often found during this phase of the inspection,” Jonathan adds. Once the standard inventory is finished, technicians will do an NESC line inspection, measuring the distance between the highest communication line and the power neutral or lowest power line. The mandate: the distance between the two lines must be more than forty inches. At this point, two more measurements will be checked: the space between mid-span lines that run to the next pole (minimum distance must be thirty inches), and between communication drop lines running parallel to a power drop line (the drops must be at least 12 inches apart). All measurements captured and verified, technicians will do a final visual inspection, documenting anything out of the ordinary. When all violations and vital attributes have been noted, the pole will be marked “complete” and the process will begin all over again at the next inventory location.